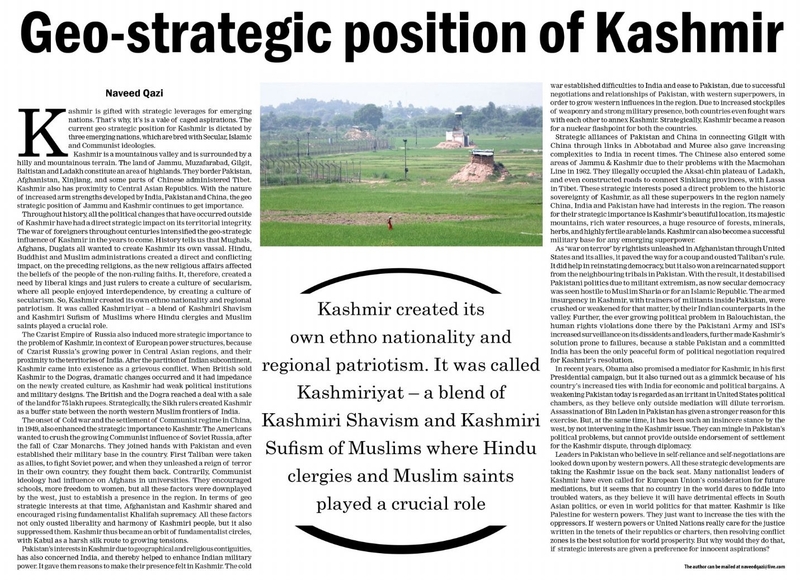 Throughout history, all the political changes that have occurred outside of Kashmir, have had a direct strategic impact on the territorial integrity. The wars of foreigners throughout centuries intensified the geo-strategic influence of Kashmir in the years to come. History tells us that Mughals, Afghans, Duglats all wanted to create Kashmir its own vassal. Hindu, Buddhist and Muslim administrations created a direct and conflicting impact, on the preceding religions, as the new religious affairs affected the beliefs of the people of the non-ruling faiths. It, therefore, created a need by liberal kings and just rulers to create a culture of secularism, where all people enjoyed interdependence. So, Kashmir created its own ethno nationality and regional patriotism. 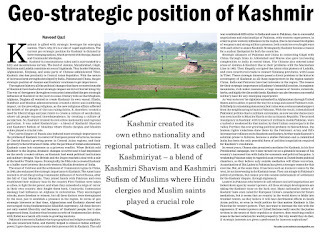 It was called Kashmiriyat – a blend of Kashmiri Shavism and Kashmiri Sufism of Muslims, where Hindu clergies and Muslim saints played a crucial role. The Czarist Empire of Russia also induced more strategic importance to the problem of Kashmir, in context of European power structures, because of Czarist Russia’s growing power in Central Asian regions, and their proximity to the territories of India. After the partition of India and Pakistan, Kashmir came into existence as a grievous conflict. When British sold the land to the Dogras, dramatic changes occurred and it had impedance on the newly created culture, as Kashmir had weak political institutions and military designs. The British and the Dogra reached a deal with a sale of the land for 75 lakh rupees. Strategically, the Sikh rulers created Kashmir as a buffer state between the north western Muslim frontiers of India. The onset of Cold war and the settlement of Communist regime in China, in 1949, also enhanced the strategic importance to Kashmir. The Americans also wanted to crush the growing Communist influence of Soviet Russia, after the fall of Czar Monarchs. They joined hands with Pakistan and even established their military base in the country. Initially, Taliban in Afghanistan were taken as allies, to fight Soviet power, and when they unleashed a reign of terror in their own country, they fought them back. Contrarily, Communist ideology had influence on Afghans in universities. They encouraged schools, more freedom to women, but all these factors were downplayed by the west, just to establish a presence in the region. In terms of geo strategic interests at that time, Afghanistan and Kashmir shared and encouraged rising fundamentalist Khalifah supremacy. All these factors not only ousted liberality and harmony of Kashmiri people, but it also suppressed them. Kashmir thus became an orbit of fundamentalism, with Kabul as a harsh silk route to growing tensions. Pakistan’s interests in Kashmir due to geographical and religious contiguities, has also concerned India, and has helped them to enhance Indian military power. It has given them reasons to make their presence felt in Kashmir. The cold war established difficulties to India and ease to Pakistan, due to successful negotiations and relationships of Pakistan, with western superpowers, in order to grow western influences in the region. Due to increased stockpiles of weaponry and strong military presence, both countries even fought wars with each other to annex Kashmir. Strategically, Kashmir became a reason for a nuclear flash point for both the countries. Strategic alliances of Pakistan and China in connecting Gilgit with China through links in Abbotabad and Muree also gave increasing complexities to India in recent times. The Chinese also entered some areas of Jammu & Kashmir due to their problems with the Macmohan Line in 1962. They illegally occupied the Aksaichin plateau of Ladakh, and even constructed roads to connect Sinkiang provinces with Lassa in Tibet. These strategic interests posed a direct problem to the historic sovereignty of Kashmir, as all these superpowers in the region namely China, India and Pakistan have had interests in the region. The reason for their strategic importance is Kashmir’s beautiful location, its majestic mountains, rich water resources, a huge resource of forests, minerals, herbs, and highly fertile arable lands. Kashmir can also become a successful military base for any emerging superpower. As ‘war on terror’ by rightists unleashed in Afghanistan through United States and its allies, it paved the way for a coup and ousted Taliban’s rule. It did help in reinstating democracy, but it also won a reincarnated support from the neighbouring tribals in Pakistan. With the result, it destabilised Pakistani politics due to militant extremism, as now secular democracy was seen hostile to Muslim Sharia or for an Islamic Republic. The armed insurgency in Kashmir, with trainers of militants inside Pakistan, were crushed or weakened for that matter, by their Indian counterparts in the valley. Furthermore, the ever growing political problem in Balouchistan, the human rights violations done there by Pakistani Army and ISI’s increased surveillance on its dissidents and leaders, further made Kashmir’s solution prone to failures, because a stable Pakistan and a committed India has been the only peaceful requirement for Kashmir’s resolution. In recent years, Obama also promised a mediator for Kashmir, in his first Presidential campaign, but it also turned out as a gimmick because of his country’s increased ties with India for economic and political bargains. A weakening Pakistan today is regarded as an irritant in United States political chambers, as they believe only outside mediation will dilute terrorism. Assassination of Bin Laden in Pakistan has given a stronger reason for this exercise. But, at the same time, it has been such an insincere stance by the west, by not intervening in the Kashmir issue. They can mingle in Pakistan’s political problems, but cannot provide outside endorsement of settlement for the Kashmir dispute, through diplomacy. Leaders in Pakistan who believe in self-reliance and self-negotiations are looked down upon by western powers. All these strategic developments are taking the Kashmir issue on the back seat. Many nationalist leaders of Kashmir have even called for European Union’s consideration for future mediations, but it seems that no country in the world dares to fish into troubled waters, as they believe it will have detrimental effects in South Asian politics, or even world politics for that matter. Kashmir is like Palestine for western powers. They just want to increase the ties with the oppressors. If western powers or United Nations really care for the justice written in the tenets of their republics or charters, then resolving conflict zones is the best solution for world prosperity. But why would they do that, if strategic interests are given a preference for innocent aspirations?